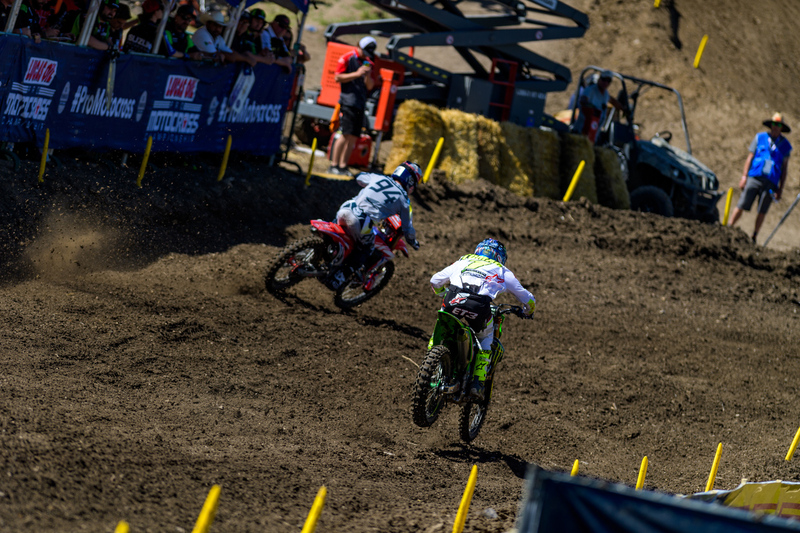 Heading into the 2018 Lucas Oil Pro Motocross Championship, the only sure thing was that the defending champ, Eli Tomac, was the favorite in the 450MX class. 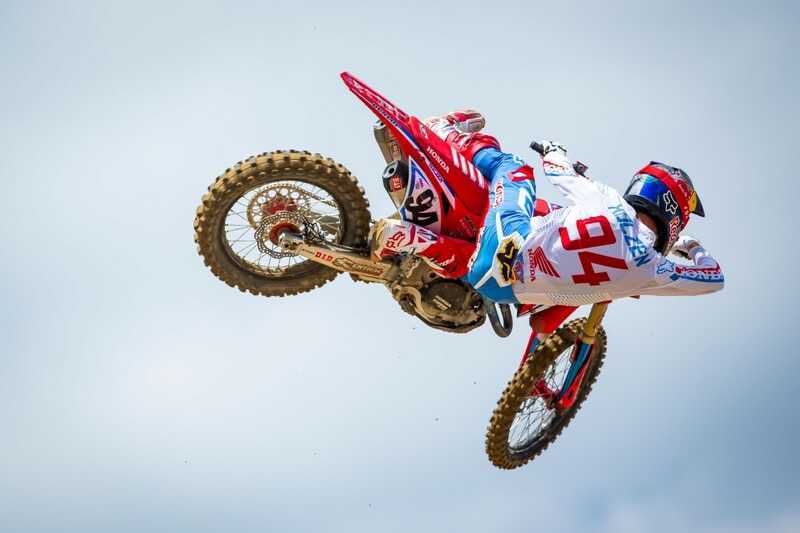 Everything else was basically a mystery, but of those mysteries HRC / Honda’s Ken Roczen was by far the biggest unknown. In the opening moto of the season at Hangtown, Kenny was surprisingly good—running near the front and finishing 6th—but in moto two he started up front only to fade all the way back to 16th. 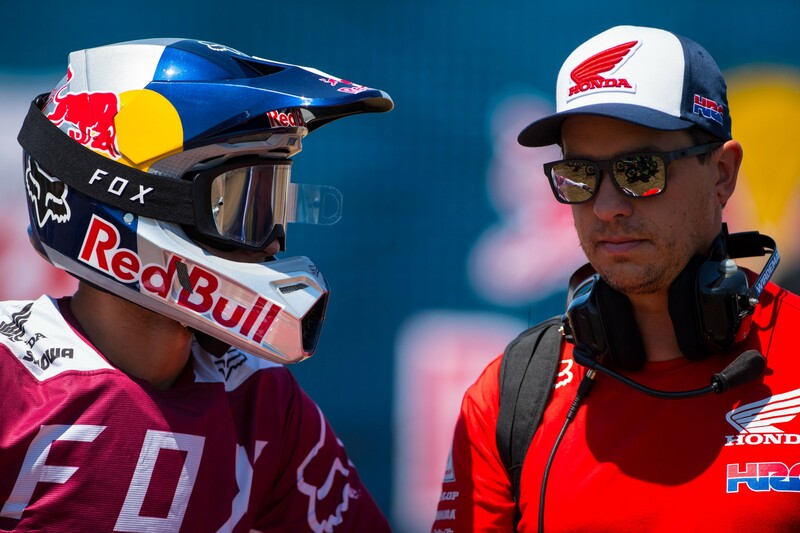 It was a tale of two different Ken Roczen’s at Hangtown so it was hard to tell what to expect at round two. At Glen Helen, though, the #94 was obviously ready to test himself and after leading Tomac for twenty-minutes in moto one and finishing 3rd, he went from last—due to a mechanical issue—all the way up to 8th in moto two. Round two became a huge confidence builder for the German and that confidence went with him to Thunder Valley. In both motos at Thunder Valley Kenny got good starts and in both motos he pushed his way into the lead. To start winning races again you must first get comfortable leading laps, and in moto one he led six laps before getting passed by Eli and in moto two he led seven laps before Eli found his way around. This time, though, Kenny was able to hang for two 2nd place finishes and a 2nd overall on the day. The 2-2 score on the day moved Kenny into 5th place in the points, but more importantly he now knows the wins are not far away. After the press conference was over, I caught up with Kenny in the pits and we talked about how it feels to be back on the podium, his health and more. Kenny, welcome back man. While you’re getting hounded by media and fans right now, it still has to feel awesome being back on the podium. Absolutely, it’s miserable being in the back of the pack. Glen Helen went a lot better and obviously I had a little malfunction there [in moto 2], but I fought hard. Now it’s getting a lot more fun feeling my race fitness coming back, because I didn’t get too tired today, which was great. To be in this position: getting good starts and battling for the win for the while at least last week. Then coming back today and leading both motos. We got a lot of laps in being in the lead. Obviously I can’t expect myself to go 1-1—Eli is on one. That’s plain and simple. I went 2-2 so I’m beyond stoked. 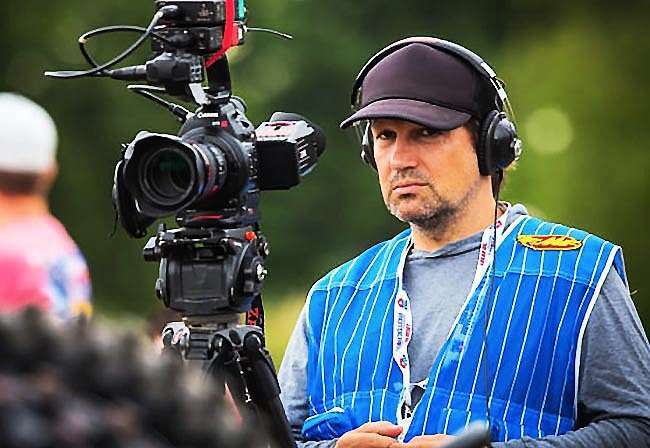 Me and the team have been working great and especially Oscar [Wirdeman, Ken’s mechanic]. He had to be very patient too, ’cause I’m his rider. We have a great relationship and now being back, being up up front, battling for wins and being on the podium is beyond amazing. I was miserable at Hangtown. I got tired, I was kind of sick and I felt horrible. I went to Glen Helen and I fought both motos and now today I was staying pretty much the same speed over the whole motos—both of them. And it was a super close gap in between the motos. It’s just confidence, getting familiar with the distance and doing my job at home. What’s the hand like right now? We heard coming into Hangtown that it wasn’t fully healed. Well, the healing…I was actually supposed to get an MRI just because, but I have tendinitis in my thumb. The joint and the tendons [in my thumb] is the problem. All the other stuff hurts, but I can’t really feel that while I’m riding. It’s the thumb part that’s pretty miserable. Especially aggravating it everyday. It’s just doesn’t go away. Was there ever a moment when you thought you might not race this year or at least make it back for the start of outdoors? Absolutely! 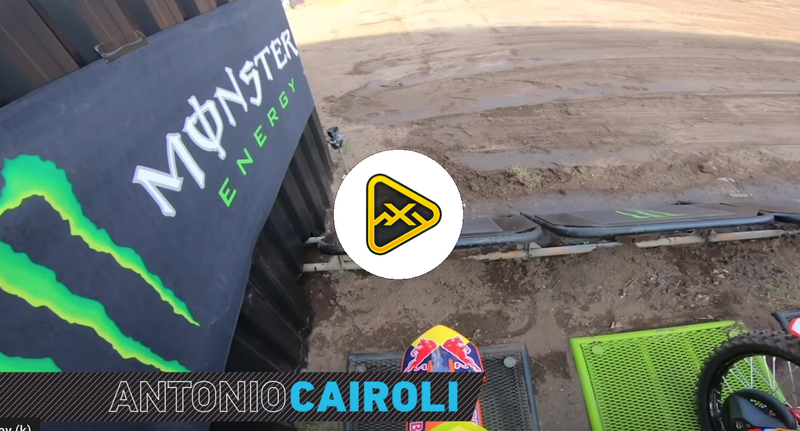 It was honestly two or two and a half weeks before Hangtown where I was like, ” I don’t know? This is not worth riding.” Because I was just putting around going so slow. My hand wasn’t feeling it. I was like, “it’s a hard decision.” I really wanted to show up and race, and I’m glad I did. With where you were at two weeks before, that 6th place moto finish to start the year was a really good start for you? That’s just racing. Getting a good start I could be up there for a little bit, but we were really off on the bike just from lack of time. That bites you too. If you’re really far off you fight everything. I would have struggled on the perfect bike, you know what I mean? So what do you do during this week off we have coming up? Training, yeah. I’m still playing catch up. No, definitely not in the first weeks. I’m still playing catch up. [Blake Baggett called out Kenny in the press conference about not getting an invite to go out on his boat in Florida. In the press conference Blake said he would pretend to be a buoy and wait for Kenny in the water if he had to.] Does Blake get the invite he wants? I’m going to be in California, then going to Florida. So the week after, for sure.